Camp expenses are sponsored by Four Seasons. Upon arrival at camp, the teens will meet their four-legged therapists and begin to explore their individual grief issues through specially planned activities. Horse-riding skills are not required to participate in this camp. During the two days of sharing and learning, through this established form of experiential therapy with horses, the teens will have a unique opportunity to explore their grief experiences without judgment or criticism. Together the teens will learn new coping skills for their grief journeys and gain confidence to deal with their changing worlds. The sessions are facilitated throughout both days by a trained equine specialist and therapist, and a hospice bereavement counselor. Teens, ages 13-19, and who have experienced the loss of a significant loved one, are eligible and encouraged to apply. Teens must be able to commit to both Saturdays. For more information or an application, please call the Four Seasons Bereavement Department at 692-6178, or go to our website at http://www.fourseasonscfl.org/. 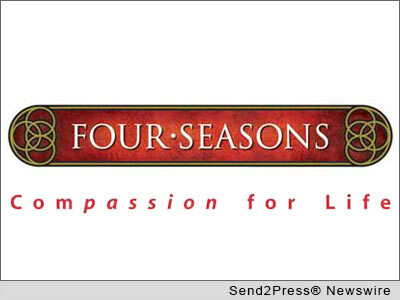 Original Keywords: Four Seasons Compassion For Life, Heart Songs Program, horses in group therapy, teen grief, equine therapy, North Carolina, hospice Four Seasons Compassion For Life Flat Rock North Carolina FLAT ROCK, N.C.
REFERENCES: Family and Parenting News, Four Seasons Compassion For Life, Heart Songs Program, horses in group therapy, teen grief, equine therapy, North Carolina, hospice Four Seasons Compassion For Life Flat Rock North Carolina FLAT ROCK, N.C.